It’s the weekend! While I’m working a sweat up in the kitchen preparing brunch and dinner for a whole day’s worth of Friendsgiving activities, I hope you’re taking it easy this morning catching up on some Food Network. I’m kind of sad because today is the last farmers market series recipe! I was really bummed that our local market ended earlier in the season. I haven’t had a chance to get to one of the closest farms so the journey sadly ends here. However, I will most definitely be bringing the series back in the late spring once the produce starts growing in. One of my biggest mistakes was starting too early and only having rhubarb or asparagus to choose from for a month. This recipe was one of my personal favorites throughout the entire series so I’m glad we’re closing out with a great one. It’s the perfect weekend dinner so whip it up tonight for a cozy meal. Acorn squash is kind of tricky to physically handle. It cooks easy and the flavor is this sweet, nutty goodness but it has a giant hole in the center where the seeds live and can be hard to maneuver. So I like to either A) slice it for salads and visually delightful dishes or B) cut it in half, roast it and fill it up. Cutting it in half and roasting it also makes it easier to scoop the flesh out and use in things like soups or mashes. I like to serve things inside the squash halves because it makes for a nice presentation. It’s also incredibly easy and a lot less work than scooping it out for another purpose, don’t you think? The filling is very easy. I used leftover farro from another meal but you could cook it while the squash is in the oven and everything will be done around the same time. 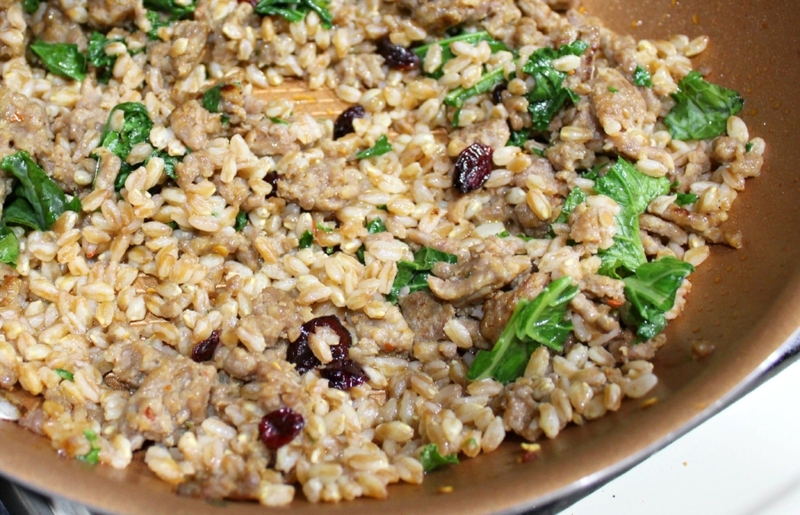 Brown the sausage in a skillet, mix together with the farro and cranberries. Add the kale and mix a bit because this will allow the kale to wilt and tenderize. Once the filling is mixed together, distribute between the squash halves and top with a healthy helping of gruyere cheese. Melt in the oven until golden and bubbly and you have a delicious, flavor packed dinner. The squash is a little sweet and nutty, the sausage is nice and spicy, the cranberries add a chewiness and sweetness, and the kale freshens everything up with a slight crunch. It’s a great dinner with plenty of flavors and textures. You might even have leftover filling after all is said and done to use for lunch the next day! Tell me in the comments if you had a favorite recipe from the Farmers Market Series this year and what you’d like to see next year. 1 - Preheat the oven to 425 degrees. Prep a baking sheet with foil. If necessary, slice the skin side of the squash lightly to create a flat surface for it to rest. 2 - Drizzle and rub the squash flesh with the olive oil. Season generously with salt and pepper. Place the flesh side down on the baking sheet, pop in the oven, and roast 25-30 minutes tender. 3 - Meanwhile, brown the sausage in a large skillet over medium-high heat. Once cooked, drain any excess grease. Mix together with the farro, cranberries, and kale. 4 - Once the acorn squash is cooked, turn over so the flesh side is up. 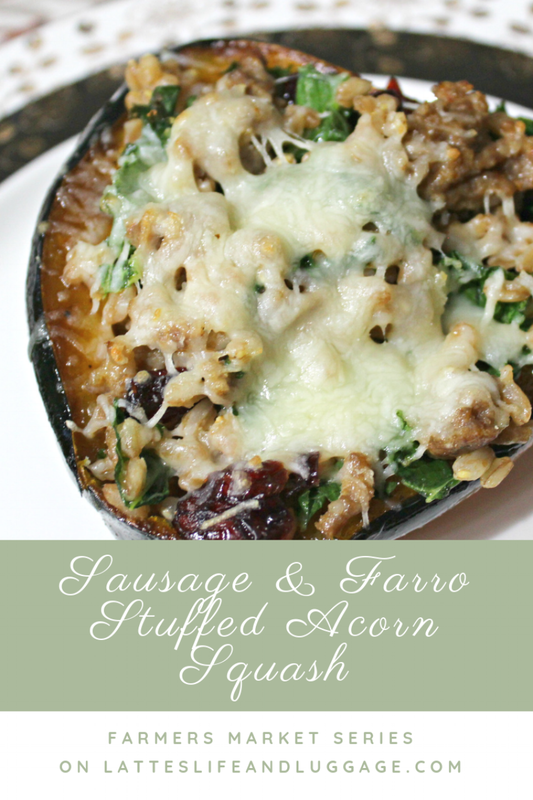 Fill each squash evenly with the sausage and farro mixture. Sprinkle the cheese evenly on top and bake 5-8 minutes just until the cheese melts and starts to get bubbly. Serve.